I’m lucky to have a few very good magazine shops nearby (if you consider constant temptation to go broke lucky) and lately, as part of my Year of Living Differently, I’ve been making a point of looking for ones that I haven’t read before. Good for my creative spirit; bad for my budget and clutter-control efforts. The idea for these cards came from a British craft magazine, Woman’s Weekly Craft Special (oh, how I love British craft magazines!). 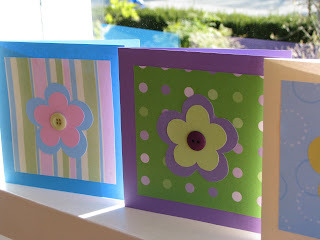 I made them using card stock, scrapbooking paper, and buttons I had on hand. One will be going in the mail tomorrow to one of my very favorite people, who has been quite sick. As usual, I had some help with the photo-taking process. The cards look good - and so does the helper, too! I like making cards too. These are really cute and simple designs. 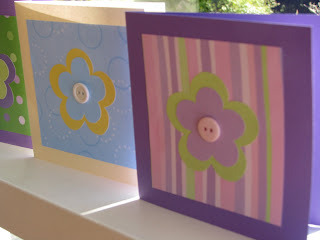 One of these cards for a friend who is sick is sure to lift the spirits!! 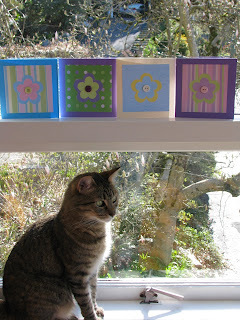 Pretty kitty and cards! Love the flowers, so cheerful. And you picked great colors.